SHOWS: BARCELONA, SPAIN (FILE MAY 1999) (REUTERS PICTURES - ACCESS ALL) (MUTE) 1. TWO STILL PHOTOGRAPHS OF OLE GUNNAR SOLSKJAER CELEBRATING SCORING THE WINNING GOAL IN THE CHAMPIONS LEAGUE FINAL FOR MANCHESTER UNITED AGAINST BAYERN MUNICH MANCHESTER, ENGLAND, UK (FILE MAY 1999) (ORIGINALLY 4:3) (UK POOL - ACCESS ALL) 2. VARIOUS OF MANCHESTER UNITED MANAGER ALEX FERGUSON WITH THE CHAMPIONS LEAGUE TROPHY MANCHESTER, ENGLAND, UK (APRIL 15, 2019) (BBC - NO USE UK) 3. (SOUNDBITE) (English) MANCHESTER UNITED MANAGER OLE GUNNAR SOLSKJAER, SPEAKING ABOUT HIS GOAL WHICH WON THE 1999 CHAMPIONS LEAGUE FINAL, SAYING: "Well, that goal has been mentioned a few times, yes. So many people have congratulated me and talked to me about that night, about how it was the best night of their lives 'but don't tell my wife', it's one of them things. But I don't mind if you get remembered for such a goal." 4. (SOUNDBITE) (English) MANCHESTER UNITED MANAGER OLE GUNNAR SOLSKJAER, SPEAKING ABOUT THE GOAL, SAYING: "It's always there but I've never seen the full game. I've seen the 15 minutes that I played, once, but that goal I've probably seen a million times." STORY: In a Manchester United playing career which spanned 366 appearances and 126 goals, Ole Gunnar Solskjaer will always be remembered for scoring the winning goal in the 1999 Champions League final. Now manager at the famous Old Trafford ground, Solskjaer reflected on that trip to Barcelona 20 years ago when United came from behind to beat Bayern Munich and lift the huge trophy. 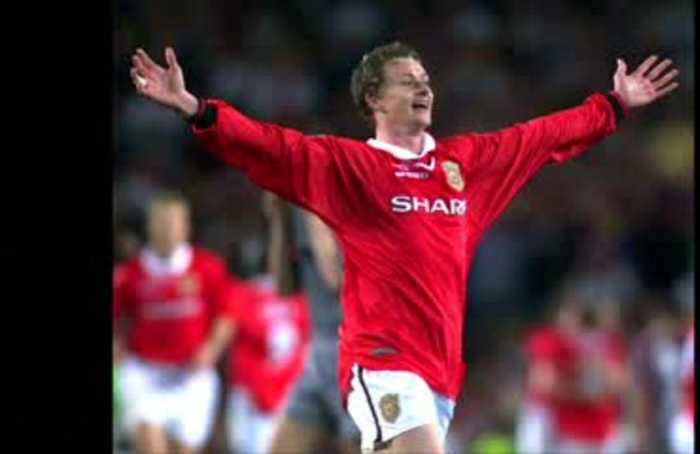 Solskjaer came on as a substitute with United losing 1-0 to the German giants, but after Teddy Sheringham equalised he seized his moment of fame in injury time. The Norwegian spoke on the eve of United's return to the Nou Camp stadium to face Barcelona in the second leg of this year's Champions League quarter-final. Solskjaer said United supporters were still telling him that he had given them the best night of their lives after his goal gave United the treble, having already won the Premier League and the FA Cup under manager Alex Ferguson.